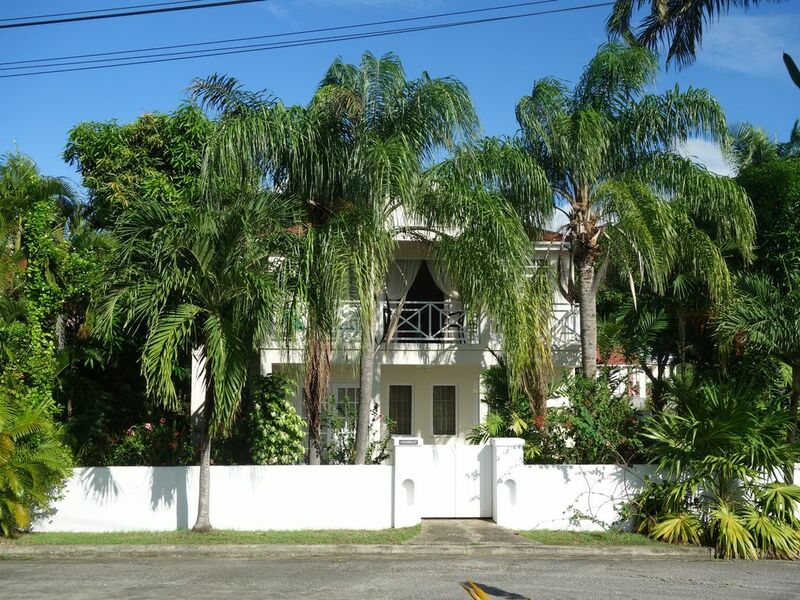 Pretty, bright spacious garden villa surrounded by palm and mango trees. The Heywood's Estate is in a quiet neighbourhood and the villa is situated in a small cul de sac, and just over 5 minutes walk to the beautiful west coast Heywood's beach. The villa is gated with automated side gate for private parking. The Master bedroom has a large bright balcony, great for breakfast or evening rum punches. Downstairs is open plan with French doors leading to a terrace at the front of the villa. Fully equipped kitchen with washing area leading to the dining area. The kitchen leads to a pretty garden room, completely private with dining table and chairs and is ideal for shade and slight breeze. There is an outside shower just to the side of the garden room, ideal for rinsing off sand from the beach. The villa boasts a pretty private garden with mango, avocado and palm trees. Stradbally Villa has been our family holiday home since 2006, having spent a couple of years living on the Island. We instantly fell in love with Barbados for the relaxed and chilled out lifestyle and perfect escape from the UK winter weather. The Heywood's Park estate is a friendly and quiet community, with a mix of locals and ex-pats. We have a wonderful manager called Helen, and she does a great job, looking after our home and welcoming our guests. We love the charm and character of Speightstown and feel we're in the "real" Barbados". To view previous guest reviews visit Trip Advisor or contact Maria for details. We love to walk down to the beach first thing in the morning and again just before sunset for a swim in the sea. We live like the locals and enjoy buying local produce from Speightstown and spend our days soaking up the warm weather. In the evenings we stroll into Speightstown for a beer, there is a good choice of cafes, bars and restaurants in the town. If you decide to stay in our home, we can provide a list of recommendations of restaurants/cafes to suit all budgets and places to see, based on our own experiences. Master bedroom has wet room and walk in closet, bedroom 2/3 have bath, shower, wash basin and toilet. There are 2 cafetieres and teapot. Plenty of plates, mugs, cups/saucers, glasses, serving dishes, cutlery, pots and pans. There are two cafetieres, tin opener, cork screw, liquidiser. Table clothes and napkins. Dining table and chairs for 6 persons in the villa and also dining table and chairs for 6 persons in the garden room. The villa is surround by garden with several palm and mango trees, there is also an avocado tree. Arrived at Stradbally Barbados to see a beautiful villa with mature gardens of mango and coconut trees. The villa is beautiful inside too, it is spacious and practical with everything you need. It has three big bedrooms two twins and one with a super king looking out to sea with a balcony that you can sit and watch the sun go down on. Each bedroom is en-suite. Walk 10 mins down the road and you will get to Heywoods beach ( our favorite) which is quiet with just a few lovely, friendly locals taking their morning swim together, it also had the best snorkeling. The villa is situated in a quiet residential area. We’ve had the best time and will definitely be back. Great home from home with sunshine ! We have had a wonderful stay and our host and property manger couldn’t have been more helpful and professional too. The villa is as described and loved being surrounded with mango tress but we felt the interior could do with a little modernisation, otherwise 5 star. The beach across the road was definitely one of the most beautiful ever visited and you are just 5 mins drive from everything. Speightown is small but has restaurants with good food from Pizza to Lobster often accompanied with live music. Would we stay again , yes as was good value for money. Thank you for sharing your villa. Thank you for your review and delighted to know that you enjoyed your time so much that you would return again one day. The Villa was just as described, only pleasant surprises! Had everything we needed for a fantastic holiday. Clean and well maintained, the owner was very easy to deal with and arranged our stay perfectly. There is a beautiful range of beaches nearby, lots of beach bars and restaurants. I have four favourites -(New) Hugo's, Fish Pot, Little Bristol Bar and The Orange Street Grocery. All are great! So pleased you enjoyed your stay and enjoyed the charming town of Speightstown, and all that it offers. We hope you return again. An excellent place to stay and the owner could not have been more helpful. But the HomeAway website is a real trial to use. Why so clunky? Why refuse part of my payment and then - within the hour - urgently demand the balance? Why welcome me to the house when I was not even there, and then hope that I had had a good holiday when the holiday was hardly started? Why make communication with the owner so difficult when her good sense was all that made HomeAway madness bearable? Beautiful villa set in a lush garden that offers serenity. We particularly liked the summer room, which is a great place for an evening meal, or to chill out, as well as the master bedroom which has a fantastic balcony that you can watch the sunset from. The location is lovely, within walking distance of the beach, shops as well as restaurants and bars. It was also very cheap and easy to get the bus if we wanted to explore. The villa was very well equipped, with everything we needed, as well as being very clean and modern. We had great communication from the manager, as well as the owner, and would definitely stay again. Many thanks for taking the time to write your lovely review. So pleased you had a great time and we hope you return again some time. We had an excellent stay. The Villa is clean, spacious and equipped with everything you may need. It's situated close to Speightown on the West Coast. The location is perfect for a tropical get away with only a few minutes walk to one of the best beaches on the island (Port St Charles). Recommended for couples as well as families. There are a variety of beach bars and restaurants nearby. The owners were fantastic and very accommodating. Highly recommended! Can't wait to go back. There are plenty of wonderful restaurants in Barbados to suit all budgets, and we can provide a list of our own favourites. Heywood's/Port St Charles Beach is about 5 minutes walk and is used by the locals, and is never crowded. All beaches running along the coast can be accessed by bus or car. Grantly Adams airport is 40 minutes by car, taxi prices from the airport are fixed, car hire is also available from the airport. If you prefer, we can arrange for transport from the airport to the villa. Due to all the local facilities, distance to beaches and frequent public transport, a car hire is not essential. Car is not absolutely essential as the bus stop/station is minutes away from the villa and run frequently. Charming Speightstown is the nearest town and has food markets, banks, art galleries, bars and restaurants. Scuba-diving can be arranged from Reefers & Wreckers. Booking Notes: 25% deposit required at time of booking. A £100 deposit is required and is returned 14 days after your stay, less any breakages. Changeover Day: Please contact owner Notes on prices: We are happy to negotiate rates for long term rentals.